It sure isn't everyday a female voice really punches your jaw exactly where it hurts. Eve sounds pretty much like Bob Dylan in the times when he tossed his acoustic guitar and plugged in his electric. Then you already figured out Eva Lalander has a voice that´s not quite looked upon as tidy or neat. It rips. It slips. You feel it all the way the bone. This is truly original even at a first listen, much because of Eva Lalanders´voice. But pretty soon you realize the songs are really strong. The first track "Long Since Gone" is ridiculously stripped down. "Slow Waltz" is enchantingly beautiful in It´s lazy vigour. Then sparks really fly, when hearing the personal favourite "021021", one of this years true highlights, succeeded by another: "So You Are Here" a pop-gem with It´s a bit warped country vibe. 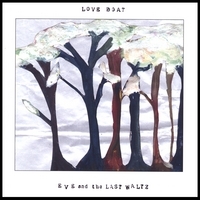 Eve and the Last Waltz is without doubt lo-fi, productionwise. A little bit cracky, with exciting cracks in the facade. But whilst others in this genre are satisfied with that much, Eva Lalander shows that after all, the most important thing is writing good songs, that touches. Points of contact exists with bands like The Concretes and First Floor Power. And it looks like this will be a great year for swedish music. Anders Tapola SMÅLANDSPOSTEN You can´t add anything to that can you? Well, ok, here´s one more: She writes the songs, and sings them straight into your heart. Even though she gets a brilliant support by the boys in the band, it's evident that the magic shines from her, with a voice effervescent, regardless whether she sings to a lonely broken piano, or rides the great rock'n roll roar, undisturbed. Lennart Persson, EXPRESSEN rated by many as the best album of 2003.